Picking between an attached or detached garage is a dilemma that many people face when building a home or adding on to an existing home. Of course, like with many things, there are pros and cons to each option so it basically comes down to what is ideal for your specific needs and only you can determine that. Here are some considerations to help you make a more informed decision on attached or detached. That’s right; the shape and size of the lot you’re building on may determine which option is ideal. For instance, if your lot is narrow you’ll likely be better off with a detached garage. Keep in mind that detached garages will take up the empty space that you may have once really enjoyed; you’ll have less of a yard. Having an attached garage means you could likely take up less yard space and leave plenty of yard for the family to continue enjoying. The main purpose for building or adding a garage will also play a role in determining which type to choose. It’s important that you’re honest with yourself in terms of what you will use the garage for. If you wish to avoid walking to your vehicle in undesirable weather, like snow, then an attached garage would serve your purpose. If you are wanting to have a shop then a detached garage would likely be a better option. It will provide the space and privacy you need; especially if you have noisy tools. Which Will Compliment Your Home Best? An attached garage means ensuring it matches or at least fits in well with your home’s current style, design and condition. If your home is relatively older an attached garage may stand out more than you like; or it could mean more expense for upgrading the exterior of your home as well, to match the garage. This is one particular reason homeowners opt for a detached garage, even if they simply want to use it for it’s main purpose; housing vehicles. Now it’s time to consider the actual construction of your garage. Building an attached garage could possibly cost less as it’s seen more as a significant home addition. Whereas a detached garage is like building a structure from scratch and might cost a little more depending on your contractor and the size of the garage. Call D Cross Barn Co. NOW! If you’re ready to take that step and add the garage you’ve been needing, call D Cross Barn Co. 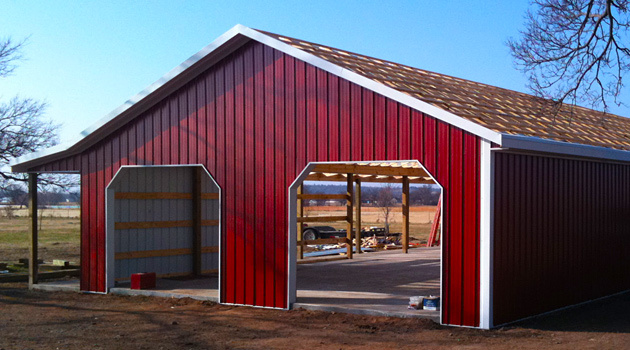 Call today to get a quote for your garage construction and let us help you deign and construct your ideal garage.